This Could Be The Biggest Dinosaur Ever Found — And It's Finally Got A Name : The Two-Way After years of study, scientists have given a name to the prehistoric colossus: Patagotitan mayorum. And in a paper published Wednesday, researchers offered the world a closer glimpse. Many believe this dinosaur is the largest to ever walk the Earth. It would have weighed more than 10 African elephants put together and had a thighbone taller than the man who helped dig it up. And, fair warning, it stands at such a remarkable height that it might take a little scrolling to get through its portrait. But for years, there was one thing the big guy didn't have: a proper scientific name. The massive dinosaur stands on display at the American Museum of Natural History in New York City last year. The plant-eating giant, which could not even fit in a single room, would have weighed more than 70 tons — or nearly the same as an empty space shuttle. In a paper published in the journal Proceedings of the Royal Society B, a team of researchers finally decided what to call this new species of prehistoric colossus: Patagotitan mayorum. The name roughly translates to the "giant from Patagonia" — with a nod to the Mayo family, which own the farm where the fossils were found. Since a ranch workman first stumbled on the bones of what would turn out to be at least six individual dinosaurs in the southern Argentine desert, paleontologists have been piecing together not just a representative skeleton of the species but also a better understanding of its features. They believe it fit into a diverse lineage of dinosaurs known as titanosauria, which itself is a subset of the massive four-legged plant eaters called sauropods — yet they still wanted to get a better sense of its family before giving a name. 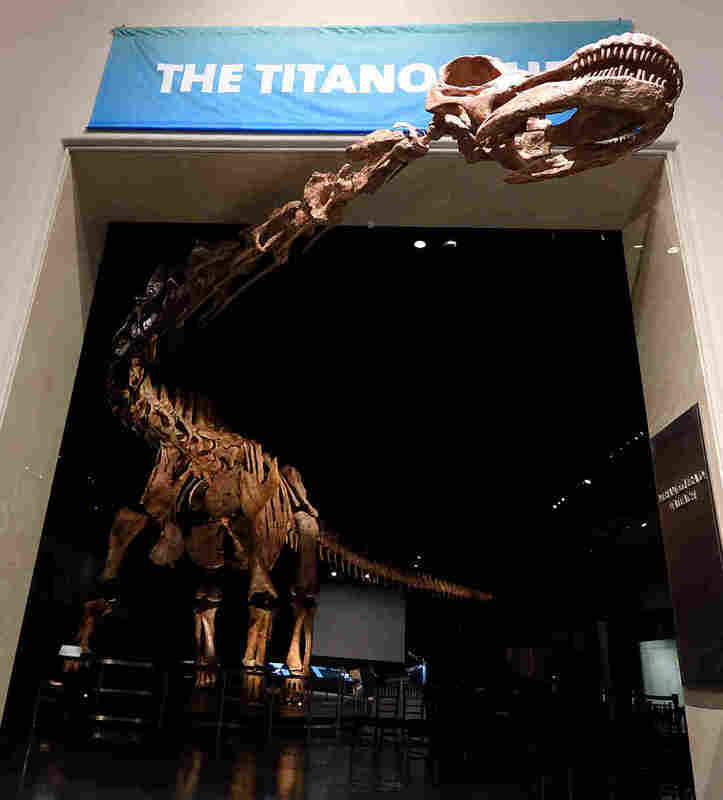 The 100 million-year-old fossils "represent the largest species described so far and one of the most complete titanosaurs," the paper's authors write, though one of the lead researchers acknowledges the difficulty of determining such a distinction. "Estimating the body weight of an extinct animal is a challenging task," says Diego Pol of the Museo Paleontológico Egidio Feruglio. "We only have left the bones and from these remains we have to infer the body weight through the use of indirect methods." Researchers say the size of the femur (from the thigh) and humerus (from the upper arm) suggests the species' mass outpaces other massive sauropods that have had those two bones preserved. And because Patagotitan's skeleton was so complete when recovered, they were able to arrive at separate estimates — through three-dimensional modeling — that "represent approximately twice (or more) the body mass inferred by the same volumetric methods for other sauropods." All told, the researchers say the dinosaur likely weighed more than 70 tons and stretched to a length of more than 120 feet. Its femur alone weighs more than half a ton. If you would like to compare Patagotitan to the famous carnivores that have made residence in the popular imagination, forget about it: Tyrannosaurus rex, for instance, "look like dwarfs when you put them against one of these giant titanosaurs," Pol told Time magazine. "It's like when you put an elephant by a lion." The titanosaur, seen here nearly spanning the width of a hangar, is considered the largest known dinosaur in the world. Yet some paleontologists remain unconvinced the find represents an undisputed record. Rather, given the margin of error surrounding such size estimates — especially estimates of other massive (but far less complete) sauropod skeletons — paleontologist Mathew Wedel argues the competition for World's Largest Dinosaur™ is closer to a "three-way tie" between Patagotitan and two other titanosaurs, Argentinosaurus and Puertasaurus. Because of that, it's not so much size that distinguishes this species, Wedel told the Smithsonian Magazine, but the fact that it's "the most complete super-giant sauropod by far." And that, at least, is something Wedel and the study's lead author, José Luis Carballido, would agree on. 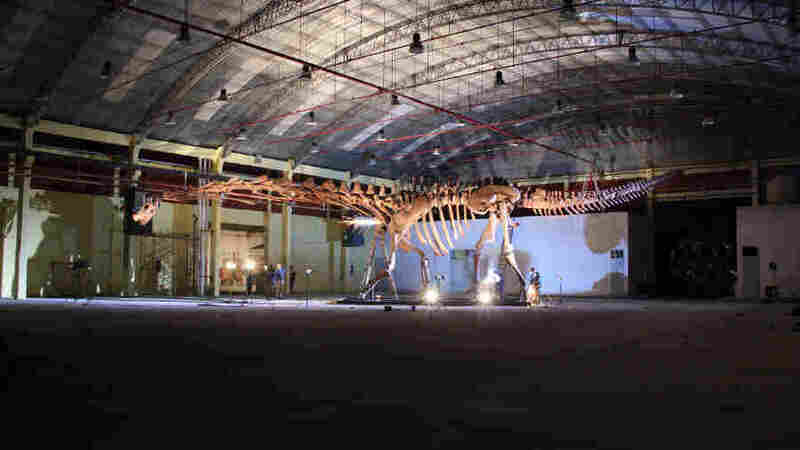 "The most amazing moment for us," Carballido told The Atlantic, "was realizing that the dinosaur is not only large, but also more complete than any other titanosaur." And that will help them — and their colleagues — better understand how this behemoth and its brethren managed to lumber through the world.